*I received a tote and markers for my review but all opinions are entirely my own. 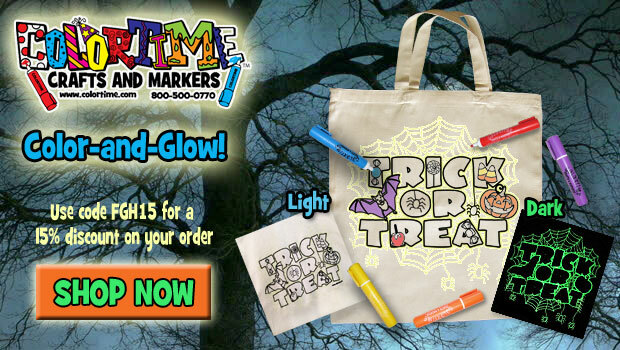 I was able to review a Halloween tote and fabric markers for Colortime. I received one canvas type tote of a decent size and one green, one purple, and one orange fabric marker to color my tote. The design was well printed on the tote bag and it was very easy to create a personal tote. I will say I wish they had included a yellow marker and a black one because three markers were not enough. The kit came with instructions on how to color the bag without bleed through affecting the back side which I found very helpful. I just found an old piece of cardboard from an Amazon shipping box and fit it inside the tote before I started coloring, The fabric markers do have a chemical smell to them so you might want to work in a well ventilated place. Because it only came with the three markers I did use my Sharpie markers to augment the colors that were provided. I found the tote very easy to color on, and the fabric markers worked well. With the design printed using a heavy outline it was easy to keep the colors contained to where I wanted them. 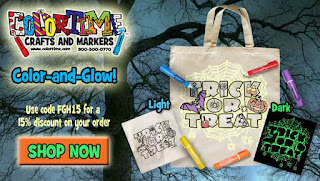 Colortime has all types of coloring projects on their website and even offers a birthday club. I was pleasantly surprised at what they offer on their website www.colortime.com , I suggest that you go take a look at what they have. Their products will make awesome Holiday gifts for any child on your shopping list.